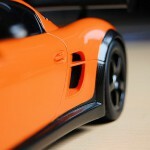 The model under the microscope today is the 1:18 Spark RUF CTR 3 Evo. 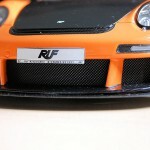 If you haven’t heard of RUF Automobile, then I suggest you get cracking on the trusty Google search engine. 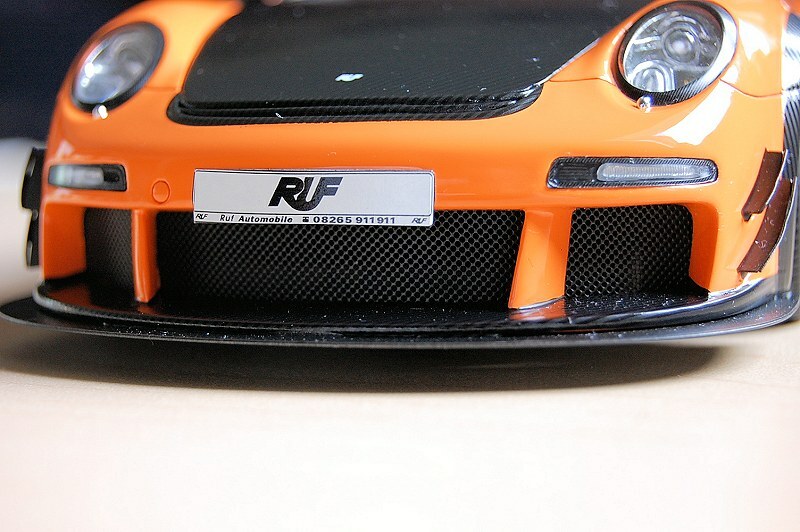 RUF is a German manufacturer of fine Porsche speed accessories and cars. 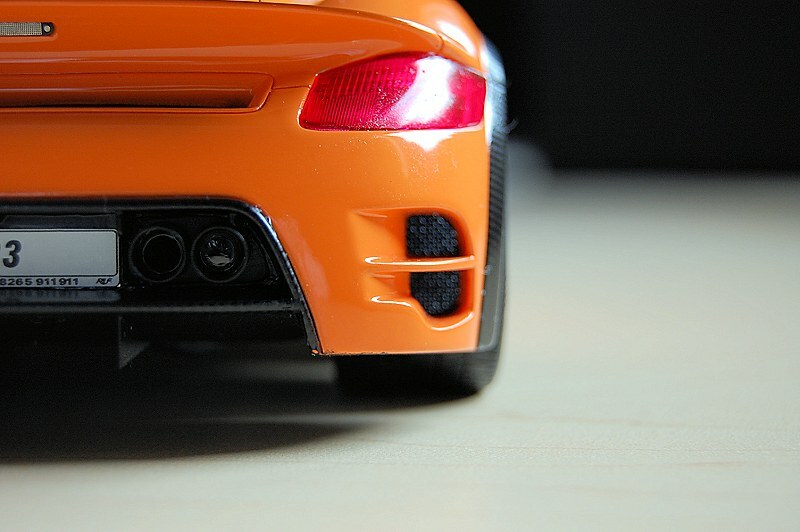 They are well known in Europe for some epic automobiles over the years, the RUF CTR Yellowbird is one, and most likely their most acknowledged effort to date. There is also a fantastic video of the Yellowbird performing at its limits @ the Nürburgring, Youtube it! 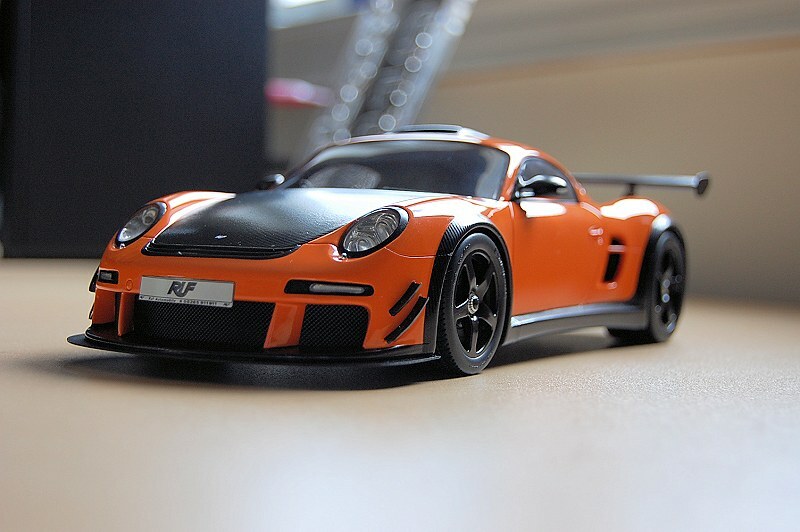 The Spark RUF CTR 3 Evo is a resin-based model. The model comes equipped with a wooden base. 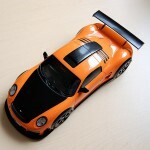 I personally have no use for it but it is a nice added bonus for those who like to display models in this fashion. At first glance, the model is strikingly aggressive. 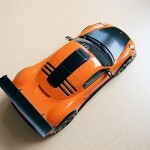 Sure, the orange exterior and carbon fiber weave do help, not to mention the massive rear wing. 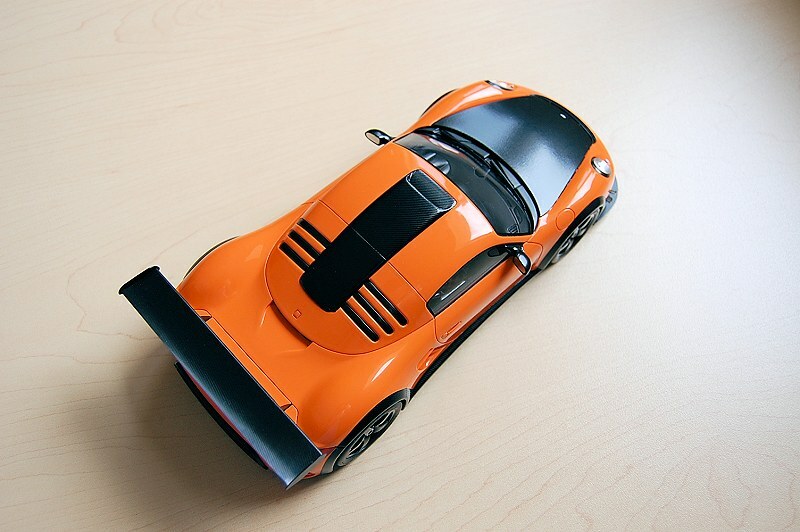 A total contrast to the more subtle sister car, RUF CTR 3. 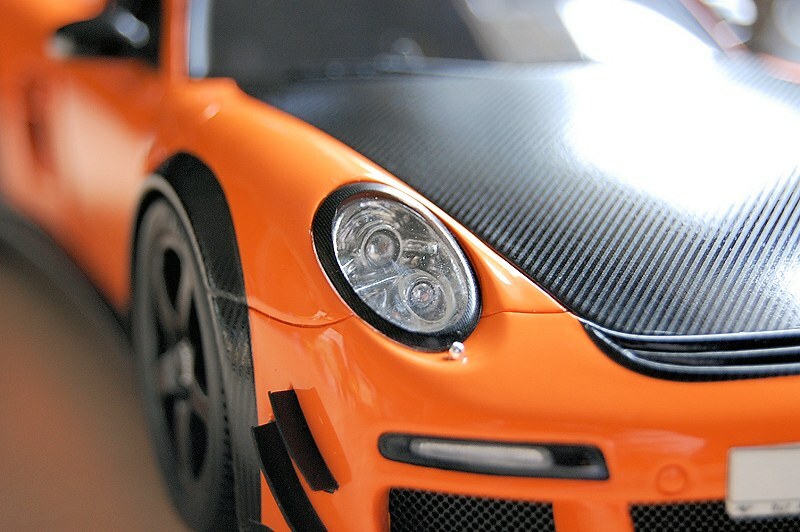 You can see the Porsche brand in the exterior of the car, that’s no secret. The Spark team did a fantastic job in capturing the detail of the original. 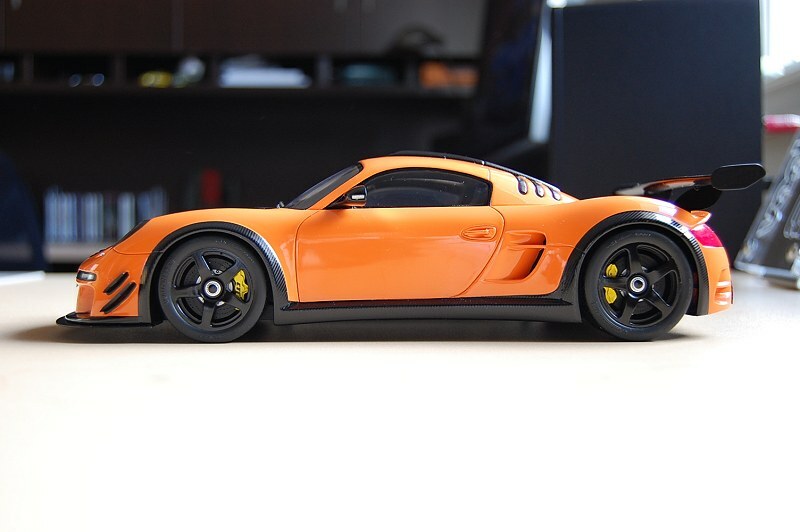 Body lines and ride height are almost perfect. 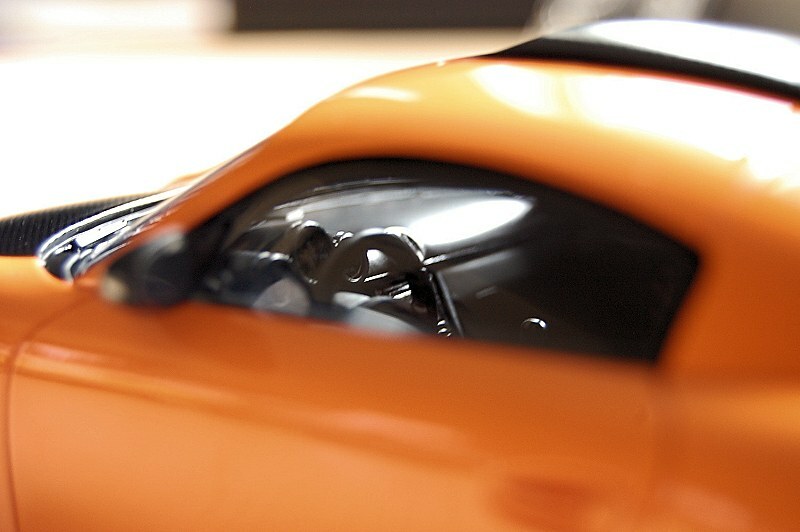 The front features two aerodynamic fins on each side, and rightly so. 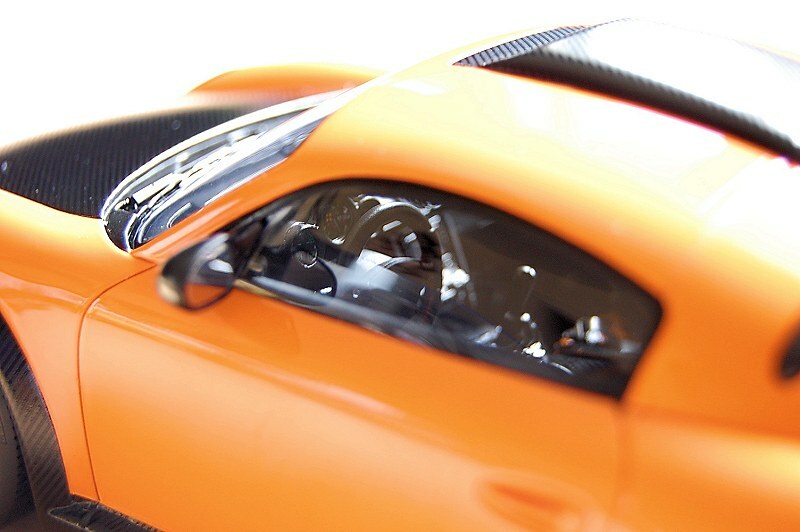 The standard CTR 3 Evo is powered by a 3.8l twin turbo power plant, producing about 700 ponies. Nuts! 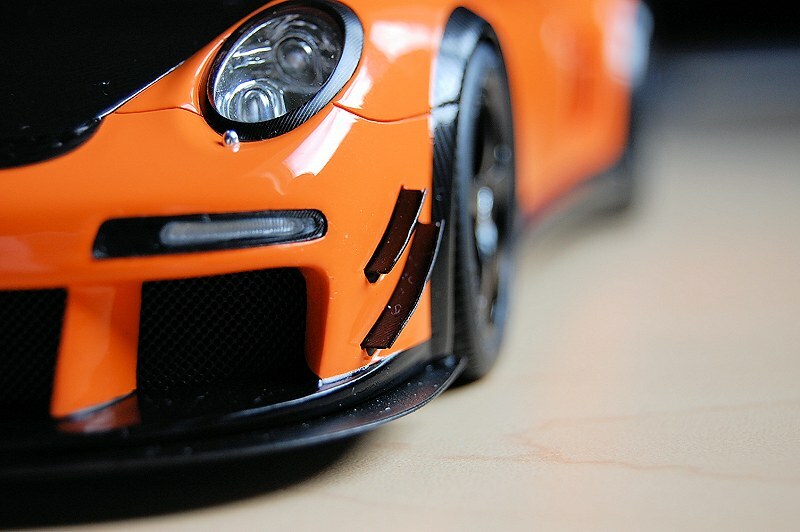 The chin spoiler is super aggressive and nicely covered in carbon fiber. 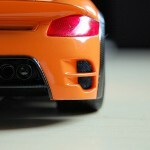 Also the lower three grilles are perforated metal. Headlights get a pass, but I would have appreciated a little more depth in detail. 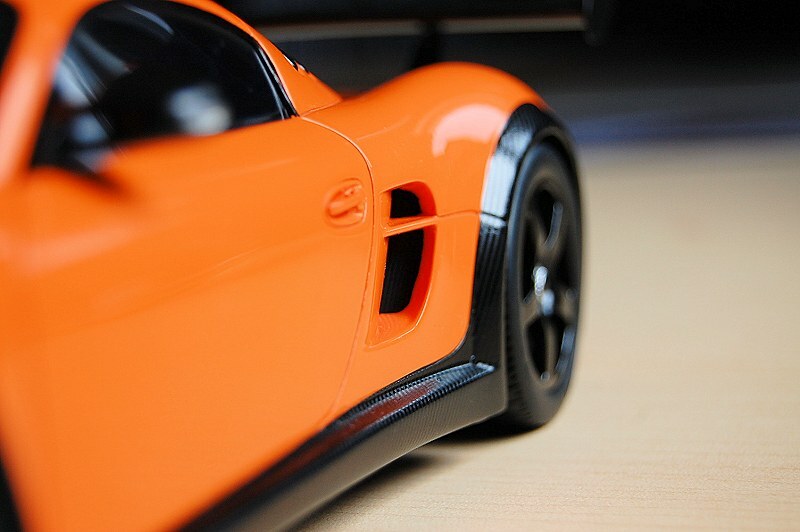 My only complaint would be some of the black detail, which may be considered part of the carbon fiber detailing, is a little rough in some areas – i.e. 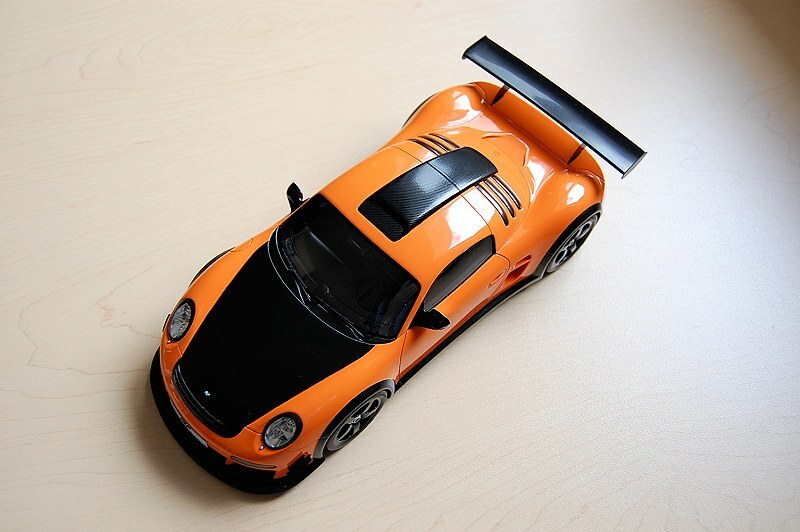 front fins and side indicators. 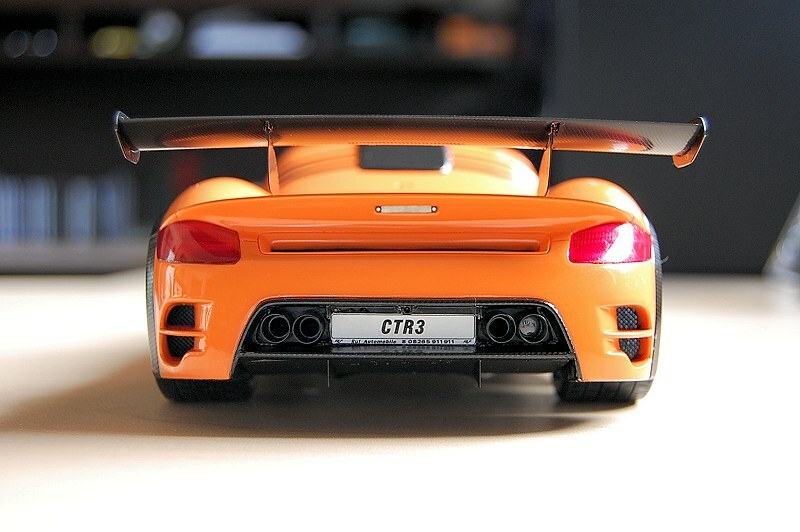 Rear is much the same, good execution throughout. 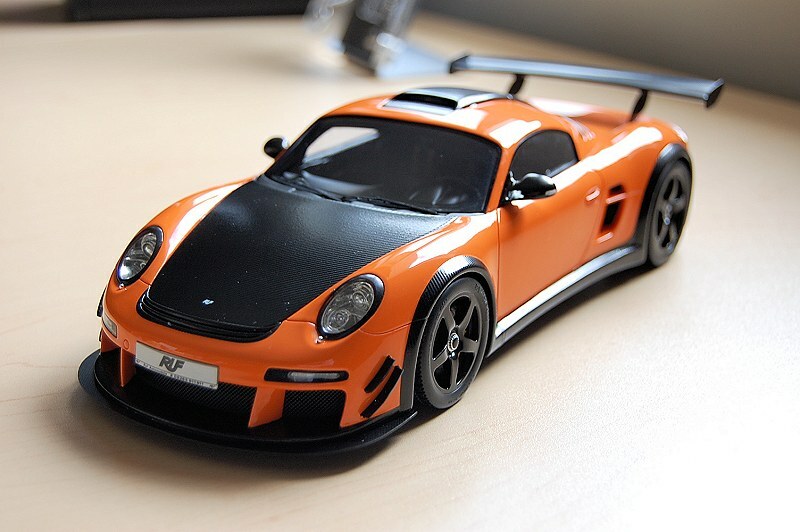 This model shipped with the rear wing attached to the model, which was opposite of the original Spark RUF CTR 3 I purchased back in 2010. No complaints here, I actually prefer this method. Side venting and cooling vent again feature perforated metal grilles. 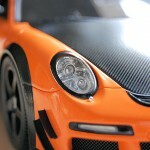 The lower rear valance is nicely covered in carbon fiber. This extends underneath the model where you’ll find two metal fins. Be extra careful when handling the model to ensure they aren’t damaged. The wheels are beautifully crafted and the tires feature actual manufacturer stamping. I’m sure many collectors will appreciate this. If you look closely at the above image you can see the Michelin brand and various tire verbiage. Nice touch Spark! 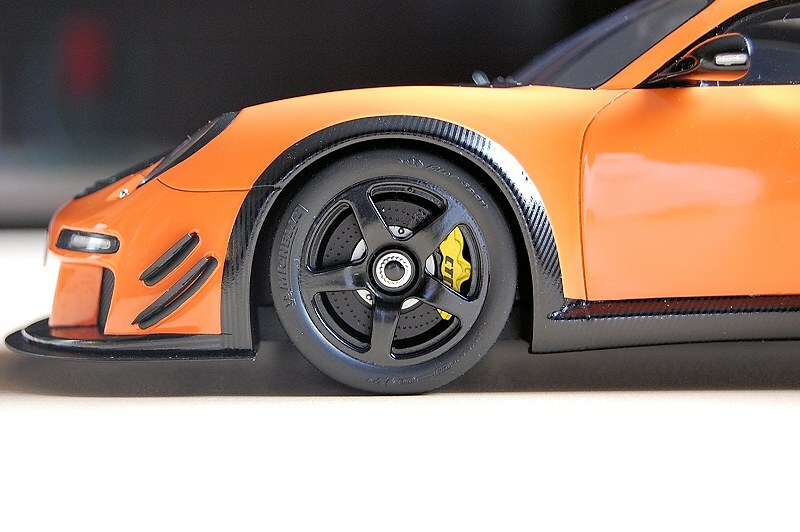 Yellow calipers add the perfect contrast against the carbon rotors and black wheels. Entire package definitely works well. 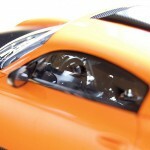 Interior is one of the best I’ve seen from a resin model in some time. 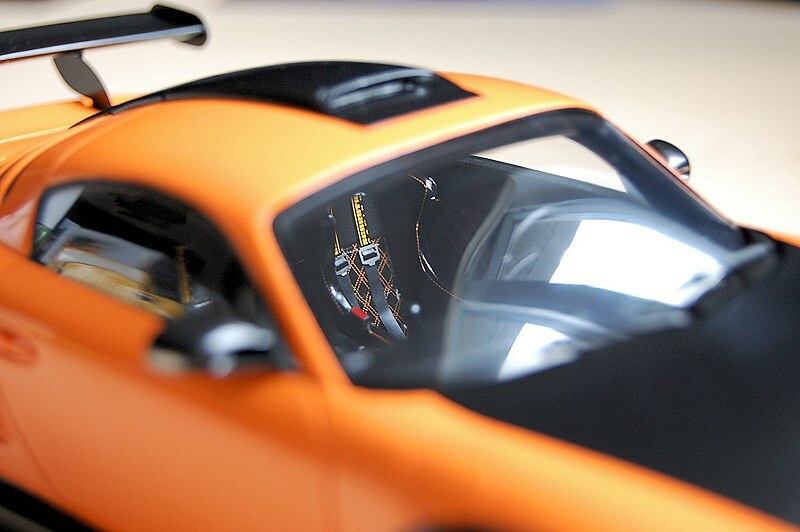 Spark did a great job in replicating the 1:18 scale interior, even to the point of getting the wall to wall leather with orange, diamond pattern stitching on the roof. I do apologise for the poor photos, or lack thereof, the sun wasn’t cooperating today. In my opinion, we have a winner. 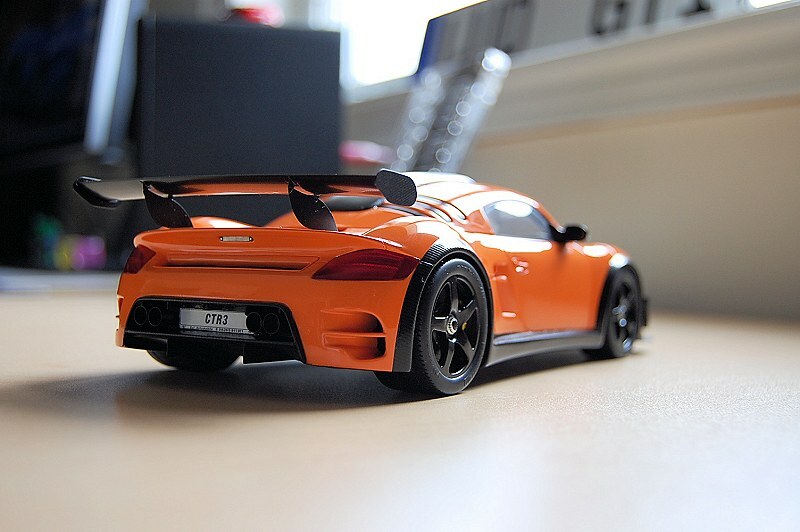 If you’re looking for a supercar with some shelf presence, this one is for you. 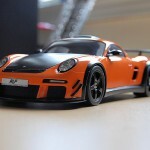 I’m sure Porsche fans can appreciate the style and performance, as the roots here are definitely Porsche. Not much I can criticize as the overall effort is solid. 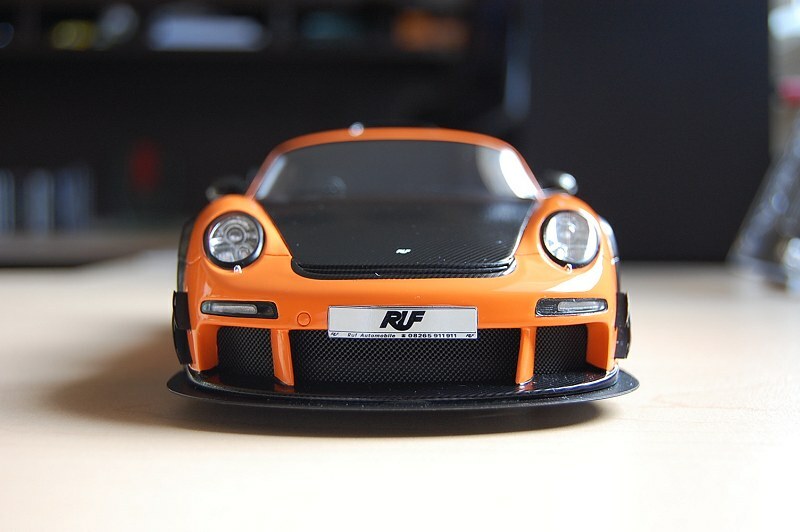 The Spark RUF CTR 3 Evo wasn’t too expensive either, on sale at Mini911.com and free shipping had this piece to my door for roughly $175. Enjoy the pics! 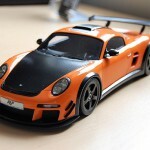 3 Responses to "REVIEW: Spark RUF CTR 3 Evo"
Is this still on mini911? I can’t find it. It may have sold out. Try contracting them, good luck!